A notice has been hanging on our office door for two weeks now: "Order your Easter cake at the café on the 12th floor". This year, Orthodox Easter falls on April 19, a week after Catholic Easter. Russian families will gather for the traditional Easter breakfast (rather than lunch or dinner) of which the Easter cake (like an outsize brioche) is the principal distinguishing feature. To make one's own Easter cake is a long and complicated process and beyond the powers of many Russian woman today. So business at the café on the 12th floor is booming. 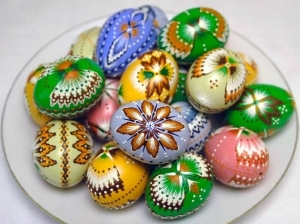 This Easter Sunday there will be an Easter cake and colored Easter eggs on the table of almost every Russian family. And the table will be groaning with all sorts of other delicacies as well. To the uninitiated, it might seem as though these people celebrating the Resurrection of Christ with such joy and abundance had not eaten for at least 40 days - that is, that they had fasted as every honest Christian is supposed to do. But that would be far from the truth. As a rule, the Russians who fast before Easter simply want to lose a few pounds before summer. Being on a diet is boring and not easy. But a diet during Lent has a higher meaning. Such a practical approach may come as a bit of a shock to the true Christian. But for Russians, a contradictory attitude toward faith in general and Orthodoxy in particular is typical. On the one hand, Orthodoxy in Russia has recently undergone a revival. Old churches are being repaired and new ones built, thousands of them. And they aren't built just for the priest: local residents begin flocking to them almost immediately. On the other hand, when the Russian Orthodox Church suggested that schools introduce Foundations of Orthodox Culture as a mandatory subject, there was a fierce debate in the press. In the end, it was decided to postpone the teaching of religion. Meanwhile, the baptism of newborns has become a popular ritual. Now everyone baptizes their children. At the same time, that visit to the church may well be the baby's first and last. No that anyone will forbid him to go to church, should he later want to. But neither will anyone take him to church every Sunday so as to turn him into a churchgoer. There will be no obligatory family services, no first communion and confession. The formal side of church life has little appeal for most Russians. What matters to them is the atmosphere: the semi-darkness inside the church, the warm light of the candles, the stern faces on the icons. Ask anything and your wish will be granted - or so it seems. Ask a Russian if he is a believer, and he will probably say yes. But in what and in whom he believes, that is another question. Most likely he will say: I believe that there exists some higher power. From this point of view, Russians are sooner pagan than Christian. To assure ourselves of the existence of some higher power, we don't need to go to church every Sunday. Our life has repeatedly confirmed it. Take the history of Russia in the 20th century: the Revolution, the Civil War, the Second World War, perestroika - every one of those events might have decimated our state and destroyed its claims to a place on the world political stage. Yes, the Soviet Union did collapse. But that collapse might easily have gone according to the Yugoslavian scenario - with a bloody civil war and the intervention of third powers. How did we manage to escape that? The rational Western mind will find an entirely "human" explanation: smart politicians came to an agreement. Whereas a Russian will say: only thanks to a miracle (read: the intervention of third powers). How did Russia survive the 1990s without disintegrating into myriad independent principalities (and becoming easy prey for third countries)? We have one explanation: it was a miracle. There were no rational preconditions for this. Now the world is in crisis and once again the average Russian is hoping for a miracle or trusting to the "off-chance" (avos') - that "magical" Russian word representing an entire philosophy of life. Somehow everything will work out. How exactly will it work out? Why will it work out? And what should we be doing to help it work out? Oh, nothing special. We'll order an Easter cake and dye some eggs. We can't do without that.